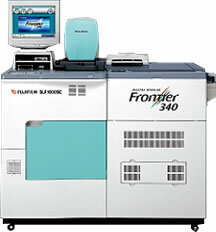 The Frontier 340 was engineered to make every aspect of production as simple and automated as possible, so that anyone could create beautiful, optimally processed prints easily without complicated procedures. Day-to-day production is simple and straightforward, and maintenance operations are designed to be as clean and simple as possible. PROCESSING TIME DRY TO DRY: 1 MIN. 40 SEC.